We build beautiful custom homes at any budget here in the Mooresville area. Find out more today! We can effectively capture the vision you have for your outdoor living space with our backyard design services in Mooresville. Take a few minutes to learn more! Let us add value and beauty to your home in Mooresville with customized home renovations. Read more to discover how we can help! 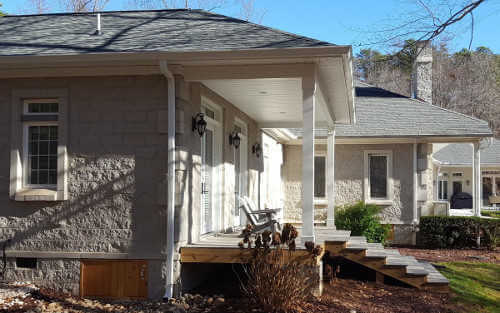 Our general contractors will see your job through, and our 30 years of experience means you can rest assured you have found the best in Mooresville, NC. For Expert Kitchen Renovations in Lake Norman & Mooresville, NC, Contact Us at Chad Goodin Signature Homes. Quality. Dependability. Affordability. And most importantly, working with you, hand in hand, to make your dream home a reality. That’s our goal. And at Chad Goodin Signature Homes, our focus is delivering a total service based on more than 30 years of land and structural development, technical expertise, integrated design services, superior workmanship and disciplined project management. Make your dream a reality. Call today for a Consultation: 704-363-7302. Building your dream home is important to us! We value quality workmanship, dependability, and above all, turning your vision into a reality. We serve Mooresville, Cornelius, Davidson, Huntersville, and Lake Norman, North Carolina, and our work can be seen all over these areas. Let us turn your lifelong dream of building a custom home into a reality, and we’ll provide excellent service and a hassle-free building process in return. Building custom homes is our passion, and we would be more than happy to show you our portfolio of work. We are the right builder for your project, and we will do whatever it takes to earn your trust and confidence. For more information, please do not hesitate to reach out to us. We have 30 years of expertise in custom homes and house remodeling. Contact us now to see how we can change your starter home into your forever home! You have a vision, and we’re here make it a reality. Just ask around. Our clients love sharing stories about our reputation of doing what it takes to build a beautiful home consistent with expectations and budget. That translates to years of comfort, relaxation, and peace of mind for them. Now it’s your turn. Over the years, we have completed many successful projects. If you have dreams of building a custom home at some point, there’s no stronger reference than the finished product. See for yourself. We’re ready and waiting to get started! Give us a call, and let’s talk. We look forward to discussing your new home and the possibility of working with you throughout the duration of the design and building phases.